Playground climbing should be as creative and fun as the WingWall®. A double-sided freestanding climbing structure, 6 feet tall by 8 feet wide, WingWall® comes in groups or singly. Each unit is mounted on a central pole that can be reoriented by staff into new, locked positions, creating new playgrounds each time. The units have climbable features, 32 grips with LedgeLocTM anti-spin technology and grab rings that encourage movement around the wings. The surface is roto-molded in UV-resistant polyethylene with a galvanized steel structure. They are built to ASTM/CPSC requirements and designed by Brewer's Ledge, building climbing walls since 1989. Now in its 23rd year, Kidstuff Playsystems brings you a whole series of new events and new play structures. Choose from more than 100 colors of powder coating and more than a dozen colors of plastic. Make your playground really stand out with the products from Kidstuff Playsystems. Protecting your investment is important to Kompan, which is why the newest addition to Kompan Galaxy features an Anti-Vandal design. Vandalism not only ruins your playground but also creates an unsafe environment. 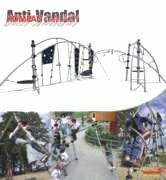 Kompan has answered customers' requests by creating a product line that protects your playground from vandals. You don't have to sacrifice play value, as these are some of the most dynamic playground structures available. Giving these new Galaxy structures their Anti-Vandal qualities is the removal of ropes, connections that require special tools to remove and materials that hold up to the toughest abuse. Unity Surfacing Systems offers unitary, rubberized safety surfacing, flooring and paver products made from 100-percent-recycled tires that interlock. They come in a wide variety of colors and thicknesses to fit your indoor and outdoor needs. All products meet or exceed ADA, CPSC and ASTM safety guidelines. As part of the USGBC, you may be eligible to receive LEED points and credits. Nicros' Boulders are a fun and attractive addition to any park or playground setting. These carefully crafted works of art are molded from real rock with climbing features that are completely natural. Highly durable and stain-resistant, Nicros' Boulders come in three standard sizes (ranging from 80 square feet to 394 square feet) and range in height from 4.5 feet to more than 9 feet. Add an appropriate landing surface, and these Boulders are ready to be ascended by the young and the young-at-heart. PlayworldTM brings the excitement of the mountains to the playground with its new, double Mountain Crawl Tube. This colorful crawl tube encourages kids to use their imaginations and play together as they crawl from one side of the mountain to the other, with plenty of space to crawl through and "peak" out. GameTime's new GlideBoard is a new innovation in play and part of GameTime's new XtremePlay line, designed to both physically and mentally stimulate kids in the 5-to-12 age group. The GlideBoard is a rectangular platform attached to a grounded ramp bordered by two rails, with a board that glides back and forth. The ramp can be approached from either side, so kids can take turns from either the same or opposite ends. Smaller kids often sit on the board and scoot or are gently pushed along, while older kids like taking a slight run at the board and jumping on. 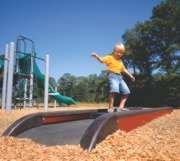 Childforms® introduces the new Child TurfTM Recycled Rubber Playground Safety Surfacing. This 100-percent nontoxic recycled rubber is 99.9-percent cord- and metal-free and will not attract bugs or pests; allow for the growth of mold, rot, or decay; or cause splinters. Create the total solution for playground safety and accessibility by using Child TurfTM with Childforms® 8-inch FuntimbersTM and ADA Accessible Ramp System. Childforms® also offers a complete line of early childhood structures and independent play events.